Salads are always a lot of fun to play around with and see what you create. Lettuce is the perfect vehicle to add absolutely whatever you want to it. 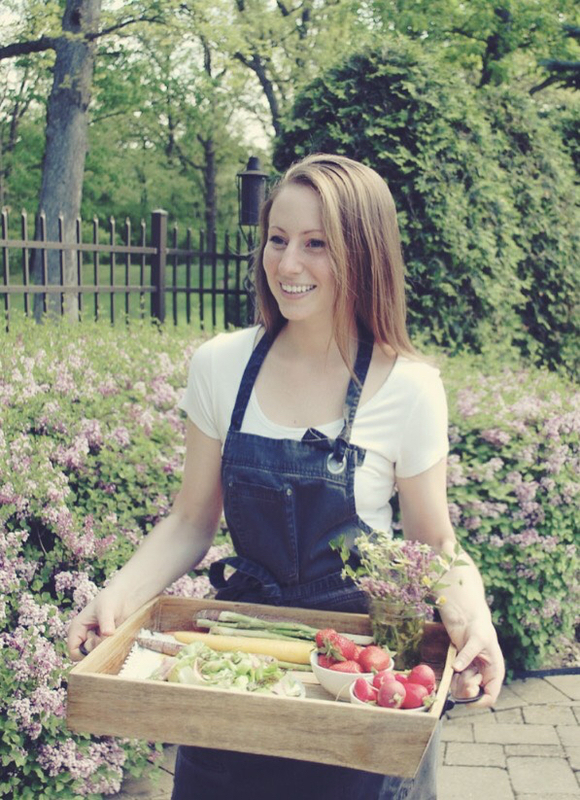 I usually keep salads light, adding lots of fresh vegetables, herbs, and maybe some sort of protein. I took a slightly different approach when coming up with this salad, making it as indulgent as possible. And trust me, it was worth it. BACON. It makes everything taste better, right? That is definitely the case for vinaigrettes. A little bit of bacon drippings goes a long way. Add in some caramelized shallots and brown sugar, and I’d say you have a pretty tasty dressing. I spoon this bacon vinaigrette over romaine lettuce that’s been grilled. 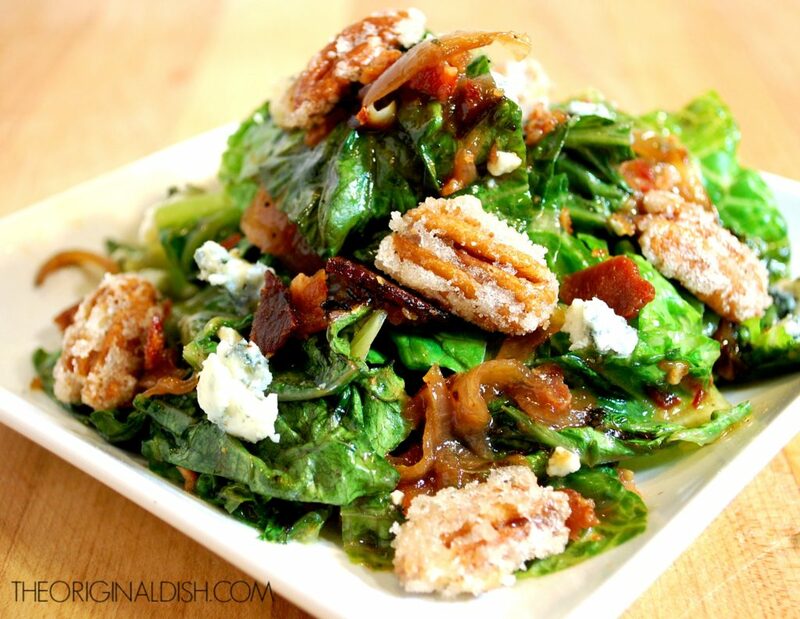 The smoky flavor adds a lot to the dish, and the warm, wilted lettuce soaks in the vinaigrette very well. 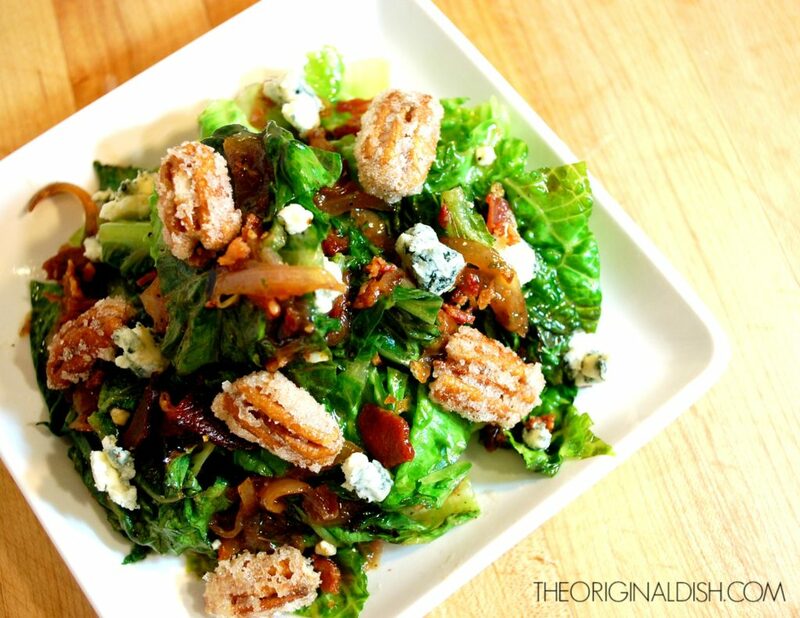 The finishing touches: lots of crumbled bacon, creamy blue cheese, and candied pecans. I make a simple syrup with a dash of cayenne pepper to coat the pecans. After adding more sugar, the nuts are baked and cooled. The result? Sweet and spicy delicacies that blend perfectly with the other ingredients in the salad. Carefully follow the steps to make the candied pecans, because they very sensitive to time and heat. Keep a close eye on the simple syrup as it starts to boil. The bubbles will change in size quickly, and they are a good indicator of when enough water has evaporated. Preheat the oven to 350°F. In a 10-inch pan, combine the water, ¼ cup of the sugar, salt and cayenne pepper. Turn the heat on high and let the sugar dissolve. Boil the syrup until some of the liquid has evaporated and the bubbles become smaller. Toss in the pecans, lower the heat to medium and cook for another minute. Add the other ¼ cup of sugar and stir to coat. Spread the pecans onto a foil-lined sheet pan. Bake for 6 minutes. Let the nuts cool on the pan before removing. Lay the bacon onto a foil-lined sheet pan. Bake for 30-40 minutes at 350°F. Remove the bacon from the pan and let cool. 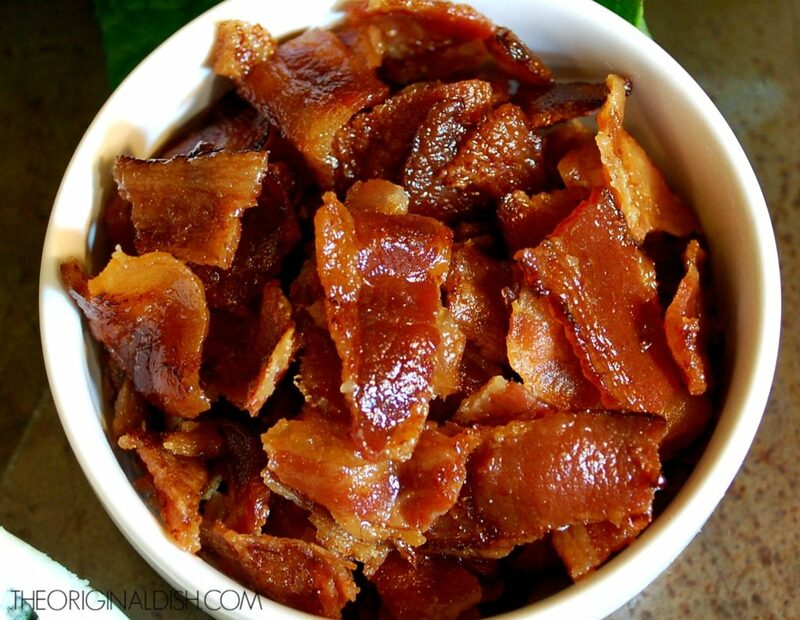 Pour the bacon drippings into a bowl. Heat ¼ cup + 2 tablespoons of bacon drippings in a medium pan over medium-high heat. Add the shallots and season with salt and pepper. When the shallots have caramelized, lower the heat and stir in the red wine vinegar, Dijon, brown sugar, and thyme. Cook for another minute. Transfer the mixture to a bowl, and slowly whisk in the grapeseed oil. Season with salt and pepper to taste. Heat a charcoal grill or set a gas grill to medium-high. 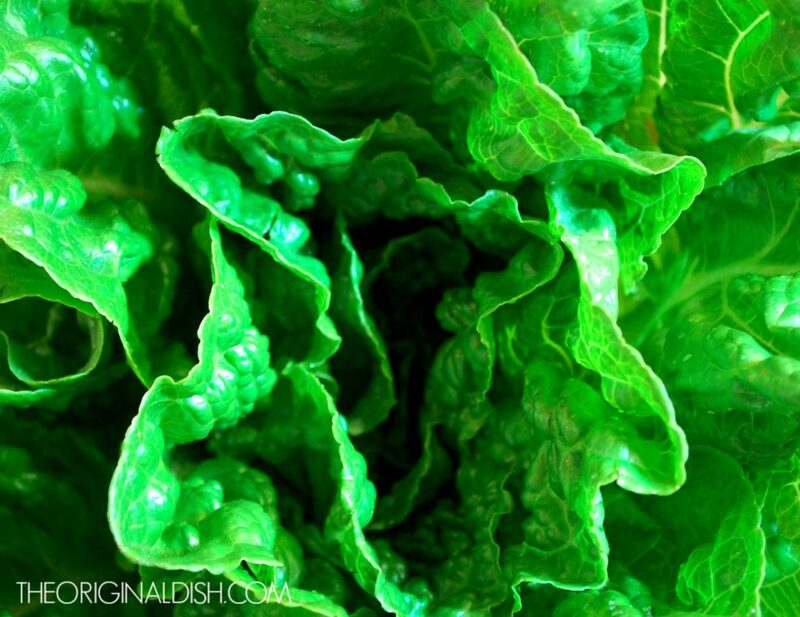 Season each half of lettuce with salt and pepper, and drizzle with grapeseed oil. Place the lettuce on the grill, flat side down, cooking for about 3 minutes. Flip the lettuce over and continue cooking until charred and wilted, another minute or two. Remove the lettuce from the grill, cut off the ends, and roughly chop. 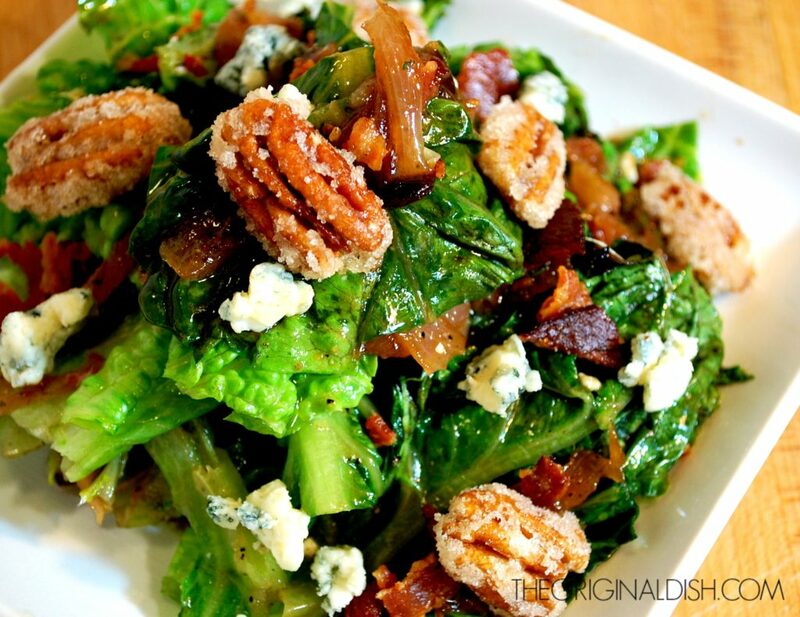 Spoon the bacon vinaigrette over the grilled romaine. 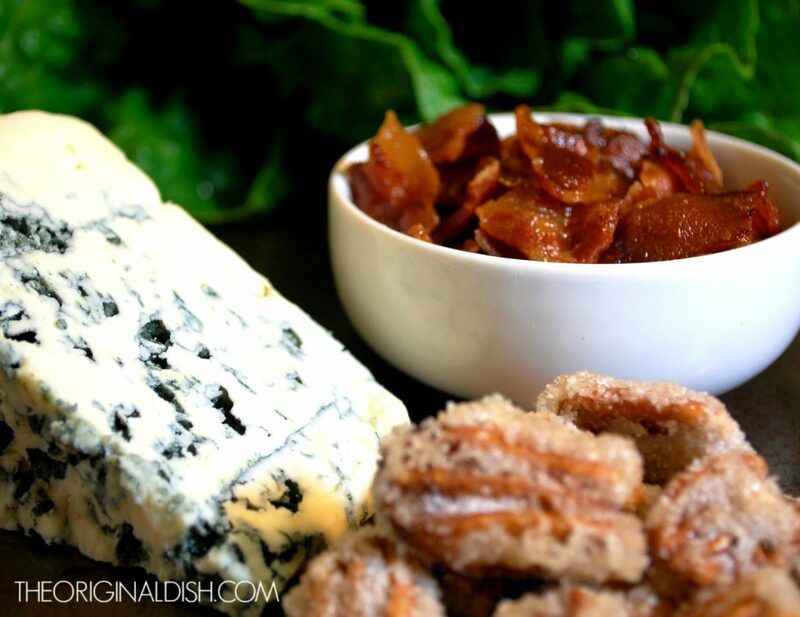 Crumble the cooked bacon on top, along with the candied pecans and blue cheese.